Based on a handout written by the Denver Dumb Friends League with the assistance of Suzanne Hetts, Ph.D., Certified Applied Animal Behaviorist. Copyright© owned by the Denver Dumb Friends League. The fact that both dogs and cats can be taught to relieve themselves in specific places is what permits us to keep them as house pets. When a kitten is about 4 weeks of age, s/he will begin to play in, explore, and dig in loose, soft materials. Many species of cats begin to show this behavior as soon as they can eliminate on their own. Kittens do not have to be taught by either their mothers or their human owners to relieve themselves in soft, loose materials or to dig and bury their waste. These behaviors are called “innate” behaviors because kittens do not have to learn how to perform them. However, where a cat eliminates can be affected by its experiences. Litterboxes which for a variety of possible reasons do not provide an acceptable place to eliminate, FROM THE CAT’S POINT OF VIEW, may cause a cat to go to the bathroom somewhere else. Thus, it is important for you to provide a litterbox which meets your new kitten’s or cat’s needs so that s/he will like the box and use it consistently. There is really no such thing as “litter-training” a cat in the same way one would housetrain a dog. The only thing owners need to do is provide an acceptable, accessible litterbox, using the criteria described below. Remember that what is acceptable and accessible must be determined from the cat’s point of view, not the owner’s. It is not necessary, or even recommended, to take a cat to the box and move his paws back and forth in the litter. This may actually be an unpleasant experience for the cat and may initiate “bad” associations with the litterbox. As explained above, a cat does not need to be taught what to do with a litterbox. If you provide him with acceptable, accessible litter, he’ll know what it’s for. Most cat owners want to place the litter box in an out-of-the-way place in order minimize odor and loose particles of cat litter tracked around the house. Often, the litter box may end up in the basement, possibly next to an appliance, on an unfinished, cold cement floor. This type of location may be undesirable from the cat’s point of view. First, if you have a young, small kitten, s/he may not be able to get down a long flight of steep stairs in time when s/he as to go to the bathroom – especially if s/he started out on the top floor a tri-level! Even adult cats new to a household may not at first remember where the box is located if it is in an area they seldom frequent. Secondly, cats may be startled while using the box if a furnace or washer/dryer suddenly comes on, that may be the last time they’ll risk such a frightening experience! Lastly, some cats like to scratch the surface surrounding their litterbox and may find a cold cement floor unappealing. So you may have to compromise. The box should be kept in a location which affords the cat some privacy, but is also conveniently located. If you place the box in a closet, be sure the door is wedged open from both sides in order to prevent your cat from being trapped in or out. If the box sits on a smooth, slick or cold surface, consider putting a small throw rug underneath the box. Research has shown that most cats prefer fine grained litters, presumably because they have a softer feel. The new clumping litters are usually finer grained than the typical clay litter. However, high quality, dust-free clay litters are relatively small-grained and may be perfectly acceptable. Potting soil also has a very soft texture but is not very absorbent. If you suspect your cat had an outdoor history, or is likely to eliminate in your houseplants, you can try mixing some potting soil with your regular litter. Pellet-type litters or those made from citrus peels are not recommended. Once you find a litter your cat likes, don’t change types or brands. Buying generic, the least expensive, or whatever brand is on sale may result in litterbox problems. Some cat litters were developed more with the owner’s needs rather than the cat’s needs in mind. Many cats are put off by the odor of scented or deodorant litters. For the same reason, it is not a good idea to place a room deodorizer or air freshener near the litterbox. A thin layer of baking soda can be placed on the bottom of the box to help absorb odors without repelling the cat. More importantly, if the litterbox is kept clean, odor should not be a problem. Some owners are under the impression that the more litter they put in the box, the less often they will have to clean it. NOT TRUE!!! 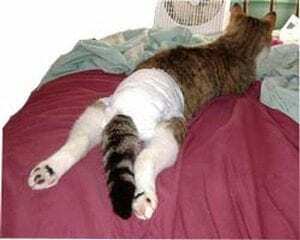 When wild cats eliminate outside, they generally choose an area that has a few loose particles of dirt or other material in which they can make a small scrape. They generally DO NOT choose areas where they “sink in” to several inches of dirt. Most domestic cats will not like litter that is more than about 2 inches deep. In fact, some cats, particularly some long-haired cats, may actually prefer less litter and a smooth, slick surface such as the bottom of the litterbox. The box MUST be cleaned on a regular basis, and adding extra litter is not a way around that chore. A good guideline is to have at least as many boxes as you have cats. That way, no cat can be prevented from using the box because it is already occupied. You might also consider placing the boxes in several locations around the house, so that no one cat can “guard” the litterbox area and prevent other cats from accessing it. In general, it is not possible to designate a personal, unique box for each cat in the household. Cats will often use any and all litterboxes available. Occasionally a cat will refuse to use the box after another cat. In this case, all boxes will need to the kept extremely clean, and extra boxes may be needed. Many cats will not show any preference for a covered versus an uncovered box. However, if you have a very large cat, a covered box may not allow him sufficient room to turn around, scratch and dig, and position himself in the way he wants. A covered box may also make it easier for another cat to lay in wait and “ambush” the user as s/he exits the box. On the other hand, a covered box tends to provide more privacy and may be preferred by timid, shy cats. You may need to experiment, and offer both types at first to discover what your cat prefers. If you do not wish ot purchase a cover, you can make one from an upside-down cardboard box with the flaps on one side cut away. Litterboxes must be kept consistently clean. To meet the needs of the most discriminating cat, feces should be scooped out of the box daily. How often you change the litter depends on the number of cats and the number of boxes you have. Twice a week is a general guideline, but depending on the circumstances, the litter may need to be changed every other day or only once a week. 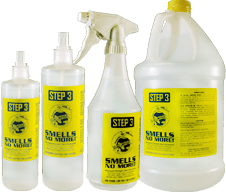 If you notice an odor to the box or if much of the litter is wet or clumped, it’s probably more than time for a change. Do not use strong smelling chemicals or cleaning products when washing the box. The smell of vinegar, bleach, or pine cleaners may cause your cat to avoid the box. Washing with soap and water should be sufficient. Some cats don’t mind having a liner in the box, while others do. You may need to experiment again to see if your cat is bothered by a liner in the box. If you do use a liner, make sure it is anchored in place well so it can not easily catch your cat’s claws or be pulled down into the litter. If your cat stops using the litterbox your first call should always be to your veterinarian. Many medical conditions can cause a change in litterbox habits and these possibilities must be considered first. If your veterinarian determines your cat is healthy, the cause may be behavioral. Most litterbox behavior problems can be resolved using behavior modification techniques. PUNISHMENT IS NOT THE ANSWER! For more assistance, contact a professional animal behaviorist who is knowledgeable about and experienced in working with cats. Invisible urine odors in carpet attract cats to repeatedly re-urinate on those affected areas. This makes getting your cat to use the litterbox very difficult, if not impossible. If there is no way to show where the urine odor sources are, you don’t know where to treat the urine stains. Consequently, your cat is repeatedly attracted to those areas to re-urinate on them. The best solution is to locate the invisible urine odors with a urine odor detector blacklight. Finally, a safe and effective aid to keep cat off counter, keep cat off furniture, keep cats out of a room, keep cats off table or bed. Repel cats from unwanted areas, Guaranteed Results! Learn More. Note: Operates with 9V battery (not included). AC Adapter with a 6 foot cord is also available. 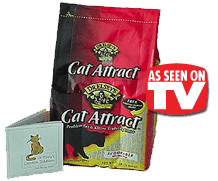 20lb bag Cat Attract™…the problem cat and kitten training litter. The new scoopable litter that provides a solution for cat owners whose cats do not use their litter box! Learn More. Eliminates urine scent so your pet will not re-urinate in same area after cleaning! 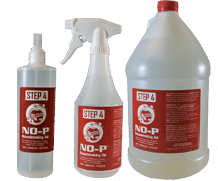 Smells No-More!™ Odor Eliminator is the first and only non-scented, stockyard strength deodorizing spray safe enough for everyday use in house training pets, cleaning litter box odors, cleaning urine soiled fabrics, etc. Learn More. 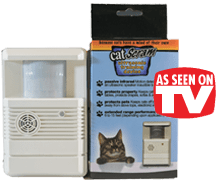 Let your kitty, cat, puppy or dog roam around the house again!